Whether you are a resident or a nonresident, fishing in the state of Minnesota requires all individuals to buy a fishing license. The good news is that the process for getting a fishing license is simple. Different fees are available for residents, members of the military services or seniors, and there are also different lengths of time to select. Familiarize yourself with the sections below before getting out on the boat and fishing to your heart’s content in one of Minnesota’s 10,000 lakes. In order to obtain a resident fishing license in Minnesota, the first thing that one must do is establish residency. To do so, you must live in the state of Minnesota for a minimum of 60 days before applying for a fishing license. Once residency is established, the next step is to apply for fishing credentials. As a resident, you can apply online with the Electronic License System, in person with a local Department of Natural Resources license agent, over the phone at 888-665-4236 and, in some cases, by mail at the DNR’s Angling License Center. During the application process for a resident fishing license, individuals 21 or over will be asked for a proof of residency. The only acceptable proofs are Minnesota driver licenses and MN Public Safety ID cards. Once you present one of these proofs of residency, payment can be given and you will obtain the desired license to fish. If an individual is visiting Minnesota and would like to fish inside the state, he or she must buy an out-of-state fishing license. If it is a group of individuals planning to fish in MN, then every single party (or couple) interested in the sport must get a non resident fishing license. During Free Fishing Days, one does not have to purchase a license, because these days serve as a trial run for visitors interested in fishing. Children under age 16 do not have to buy a non resident fishing license. Individuals assisting licensed disabled fishermen do not need to be licensed themselves. For more information on the process of obtaining an out-of-state fishing license from Minnesota, consult our helpful guide. There may come a day when your fishing license is lost or stolen. In this case, you will have to get a fishing license replacement. Fortunately, there are multiple simple ways for you to go through the process. The first and most convenient option available is to use the Electronic License System. By filling out the application online, you will be able to save yourself a good deal of time and effort. An easy alternative to filing online is applying for a duplicate over the phone. Call 888-665-4236 and you will be connected to a system that runs 24 hours a day, seven days a week. The final option is to visit a local Department of Natural Resources license agent and apply for a replacement license to fish in person. Only certain circumstances will allow you to apply by mail. If you are a resident who is 21 years of age or older, remember that proof of residency must be provided when replacing fishing licenses. Minnesota driver licenses and MN Public Safety ID cards are both acceptable proofs of residency. For those individuals who are willing to make a lifetime commitment to the sport of fishing, lifetime fishing licenses are also available. And there are a number of them to choose from. In the state of Minnesota, you can purchase a general license to fish, a spearing-only license, a spearing/angling license, a sports/spearing license and more. Prices will vary based on the selection. Resources can distribute current regulation booklets and keep accurate tabs on the amount of active licensees. In the state of Minnesota, there are no age restrictions that one needs to worry about when it comes to fishing. As long as an individual is in good health and wishes to fish in the state, he or she can easily obtain a recreational fishing license in MN. It also does not matter if the senior citizen in question is a resident or a nonresident. As long as you can provide the necessary payment and proof of residency (if you are a resident), the application process is quick and easy. Furthermore, the license fees are less expensive across the board for individuals age 51 and up. In addition, there is one group of seniors that does not need to get a fishing license. If a senior citizen is currently enrolled and participating in an adult day care program that is run by a Minnesota-recognized boarding care or nursing home, he or she does not need a license to fish. Veterans and members of the military do not have to meet the same requirements as civilians in Minnesota. 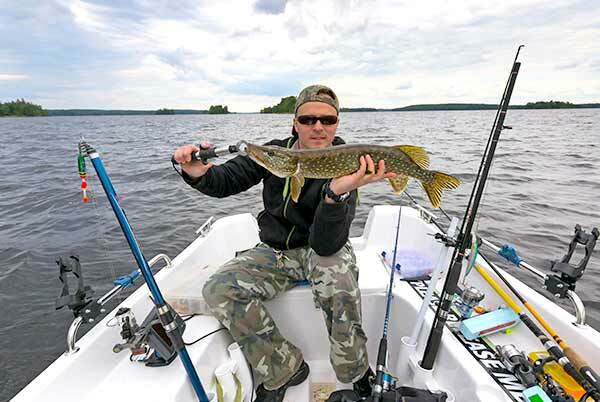 In fact, any person who is currently in the United States Armed Forces and is stationed in MN can buy a resident fishing license, even if he or she has not established residency. If you are a resident of Minnesota, on the other hand, and have been on duty outside of the country in the last two years, you can legally fish without a fishing license after your discharge, as long as proof of residency and discharge are provided. In addition, Minnesota veterans with a completely service-related disability can receive a permanent license to fish from the DNR. Although certain members of the military must meet specific requirements, there are other Armed Forces personnel who are exempt. For example, Minnesota military members who are home on leave do not have to meet licensing requirements. Veterans Administration patients do not have to meet requirements either, as long as they can present written consent from the chief executive or superintendent of the institution.